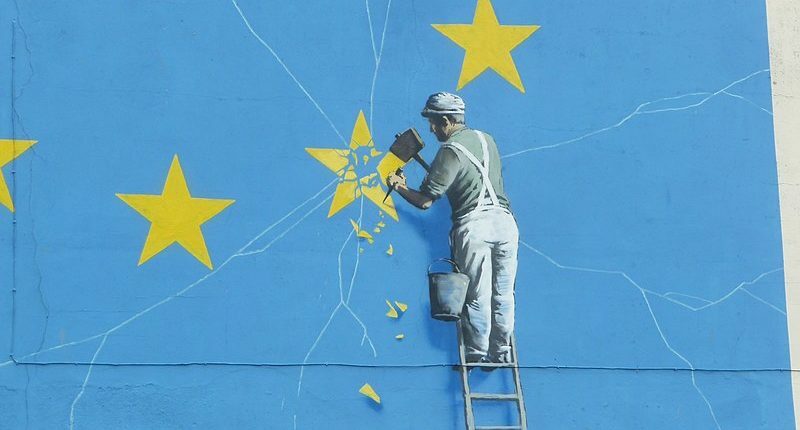 In June of 2016, the British Government asked its citizens to take a vote on whether the country should carry on being a part of the European Union (EU) through the means of the, now famous, Brexit Referendum. Although most experts and pundits predicted that the populace would vote against leaving the EU, when the results were announced, the polls spoke otherwise. With a minuscule margin of 2%, Britons voted to exit the EU. This decision took the world by surprise and simultaneously made the term ‘Brexit’ a household word. As of now, there are two possible ways Brexit is going to play out, much like a divorce. There is the ideal exit that everyone is hoping for, in which the British government can strike a deal with EU on the various logistical and economic agreements between them, like a divorce with a prenup. Then there is the exit, that people are not looking forward to, where the British government is not able to come to an agreement with the EU and establish a deal with them. This scenario has been dubbed the ‘No-Deal Brexit’. Either way what are the implications of the United Kingdom leaving the EU? How does it affect the global economy? To be specific, how does it affect the Indian economy? Before trying to answer any of the above questions, we need to understand the effects Brexit will have on the British economy. Since 1992 the pound has been freely floated on the currency markets. ‘Free-floating’ is a term used for currencies whose value is ascertained as per the supply and demand it has on the forex market. The upside of free-floating currencies is that it is flexible enough to adjust for external shocks like oil price hikes, etc. However, when there is political unrest in the native country of the currency, it can take quite a beating. 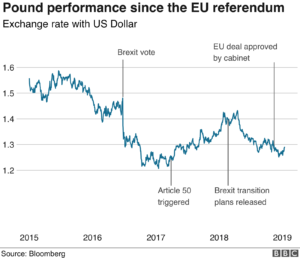 As can be seen from the above chart, the pound valuation saw a drastic decline as the results of the referendum was publicised. The pound dropped by nearly $0.18 against the dollar making it the largest intra-day collapse in 30 years. As per the study that the UK government released mid-November 2018, the British economy is bound to perform worse off than it does as part of the EU bloc. “It is true that the economy will be very slightly smaller, but if we do the deal in the way that the prime minister has set out and negotiated, that impact will be entirely manageable,” UK Treasury chief Philip Hammond. Whereas, the Bank of England’s studies showed that Prime Minister Theresa May’s plan could lead to new trade barriers degrading the UK economy down by 0.75% by 2023. Although, if the PM can negotiate a good enough deal with no customs checks or regulatory barriers the economy could grow 1.75% larger. These speculations are on the assumptions that the UK leaves the bloc on amicable terms. Assuming the worst and the UK leaves without a deal, the economy of the country will take quite a hit in the gut. The government speculates nearly an 8% smaller economy in 15 years. Sectors which heavily rely on the EU such as auto, chemical and pharma, could see a decrease of 20% in the long run. The question in everyone’s minds is not whether or not the UK economy is going to see a reassessment, but when this reassessment is going to come. When we start talking about the effects Brexit will have on the world economy; we need to keep two things in mind – globalisation and ambiguity aversion amongst businesses. To begin with, Globalisation has ensured that the different economies around the world are reliant on each other in various capacities. When a drastic shift in the socio-political dynamics of a country such as Britain occurs, its effects are visible throughout the world economy. Moreover, no business likes ambiguity. If there is excessive volatility in the political landscape of a country, the impact on the economy is obvious. These points hold true in the case of Brexit. There is a noticeable shift in the attitude of businesses who have set Britain as their base of operation. Nearly all businesses are formulating contingency plans in case the UK leaves the bloc. Investments by companies into their operations in Britain have started dwindling. 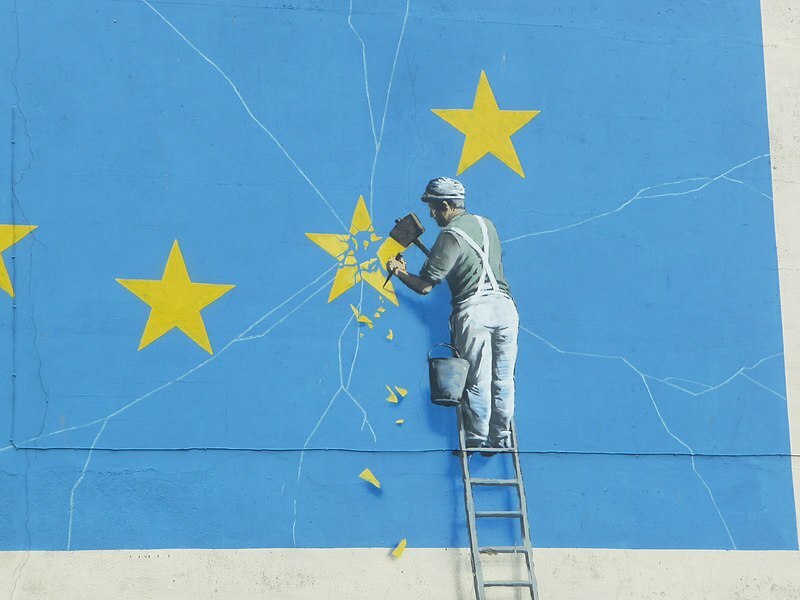 With Brexit, the UK is possibly looking at less efficient economic interactions, less resilience and more complex cross-border financial flows leading businesses to take their operations to more serviceable alternatives in other parts of the world. But how does this affect us? Brexit has already shown its effects in the Indian Economy. On June 24, 2016, soon after the Britons decided to leave EU, the Sensex plummeted by 450 points. This effect was even before the UK exited the EU. So, we can extrapolate what would happen when the actual exit takes place. Many Indian businesses have operations in the UK, who stood as the access point to the rest of the EU. However, the volatility of the situation is forcing them to reconsider moving their operations to more functional options. Their primary purpose in setting up operations in the UK was to take advantage of the benefits the country provided them as part of the EU. If and when Brexit occurs these benefits would become obsolete, which is not good news for Indian businesses. On the other hand, Brexit opens up the possibility to renegotiate our economic stance with both the British government and the EU. If the negotiations are conducted with tact and efficiency, we could come out of it with a better deal than what we have as of now with the involved parties. In any case, with the national elections this year, it is possible that solidifying our position in the global economy may not be the first item on the government’s to-do list. As we mentioned earlier, many Indian companies have set their base of operation in Britain or have deep ties with the various sectors in the UK. Industries like automobile, chemical and pharma will see volatility due to the change in currency valuation and new trade agreements that will be established between India and Britain. The Indian IT sector is sure to be a victim of Brexit; the reportedly $108 billion industry sees 17% of its business coming from the UK and 11.4% from the other countries in the EU. If the UK leaves the EU without a deal, the businesses in the IT sector will have to reorganise their strategy to tackle the massive hit Brexit will deal it. These effects can be mitigated with “further moderation in growth in the UK and EU and the resulting probability that the companies lower their IT budgets” (FICCI). As of now, in lieu of the uncertainty among the Britons themselves about whether they will opt for a no-deal Brexit (hard exit) or a deal Brexit (soft exit), it is difficult to make any concrete statements. Whether the country gets a No-deal Brexit or a Deal- Brexit, the effects are going to be visible not only in Europe but the whole Globe. Given that the Indian economy has deep ties with the British economy, the effects are going to be visible here. For now, all we can do is wait and watch as to what happens on the 29th of March. Why has the RBI kept a close check on inflation?